We only know one person born today. He is our old friend Dave Berry who we got to know in Lennox ward. I served as his Executive Secretary and later Dave ordained me a High Priest. What is very interesting is that I first got to know him when I helped bring him back into activity. One of the funny things he shared with me is that the first time he and his wife Karen first came to church and saw me sitting with the deacons on the front row, he thought I was just an over-aged Aaronic PH holder. Actually I was the deacon’s quorum advisor. Mary was not feeling very well this morning so she stayed home to rest up but she went to the office in the afternoon to take care of the mail – neither rain or…whatever. 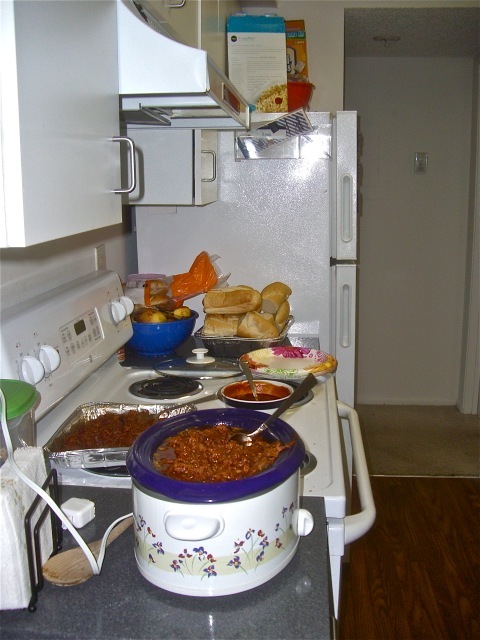 This entry was posted in Fort Lauderdale Mission on February 29, 2012 by Bill. 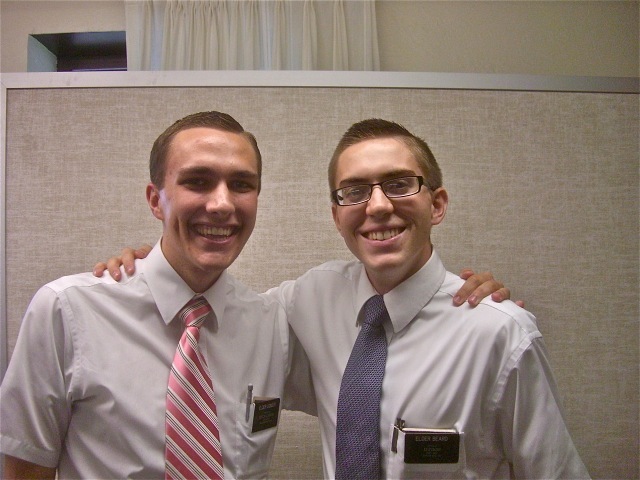 Elder Plowman was called to be district leader when elder George went home on last Thursday. Today was his first district meeting as a DL and he did a great job. He did not try to be elder George, he was confidently himself. He taught well, set a few strong but reachable goals for blessings and baptismal dates and committed the district to achieve them. We got to be a part of the meeting and role playing from the zone leaders. After not many changes last transfer, this time there were a number so I took pictures of the new companionships so we would have them to post here. 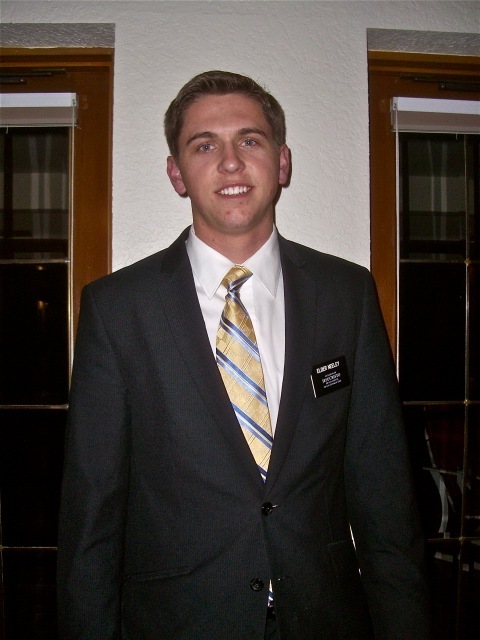 Elder Wilson joined elder Smoot, elder Conger became a zone leader with elder Beard and elder Grant, who is brand new in the mission, is now being trained by elder Plowman. 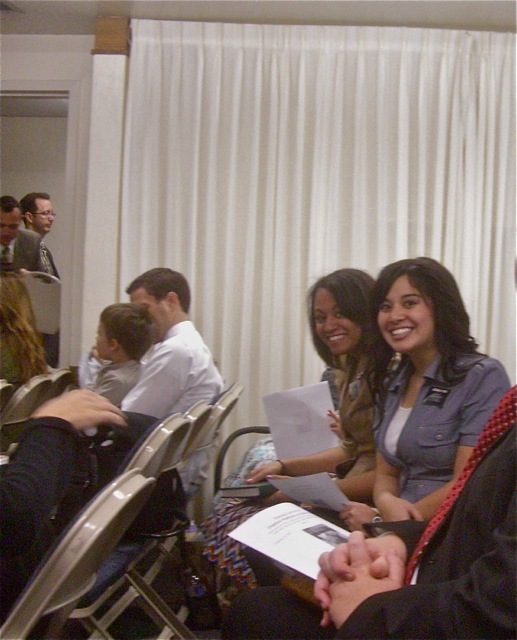 We found out that elder Grant is from New Jersey and knew our friends elder and sister Taylor while they served there. I sent a copy of this picture to the Taylors who are now serving in Botswana and told them he was serving in our district. 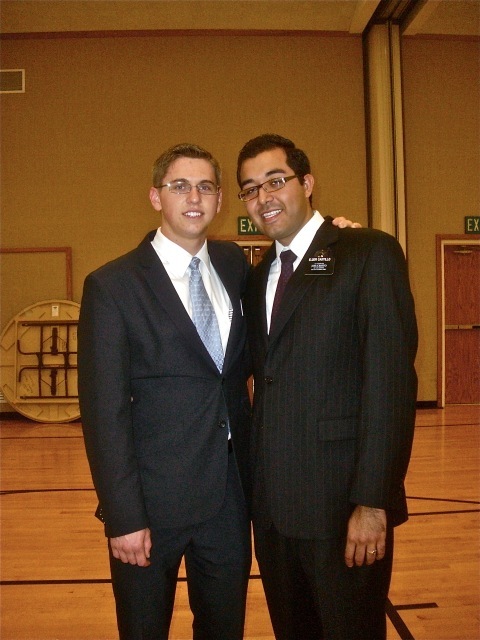 The Taylors wrote back that elder Grant was a very strong young man and that he would be a great missionary. 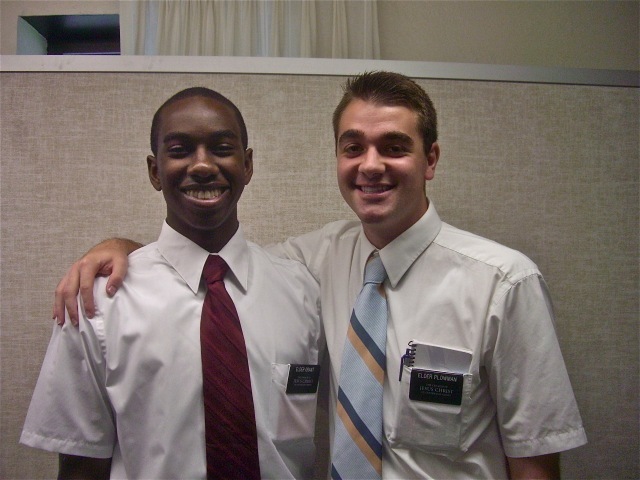 Also I mentioned to sister Beagley in the office that we knew someone who had known elder Grant back in New Jersey and she mentioned that it was very much a tender mercy for him to be serving in the ward they attend because they are teaching an African American woman who thought all elders and members were white. She was surprised to be met first by another woman who was also black and then got to meet elder Grant. So the Lord does direct his missionaries to the right mission and areas. 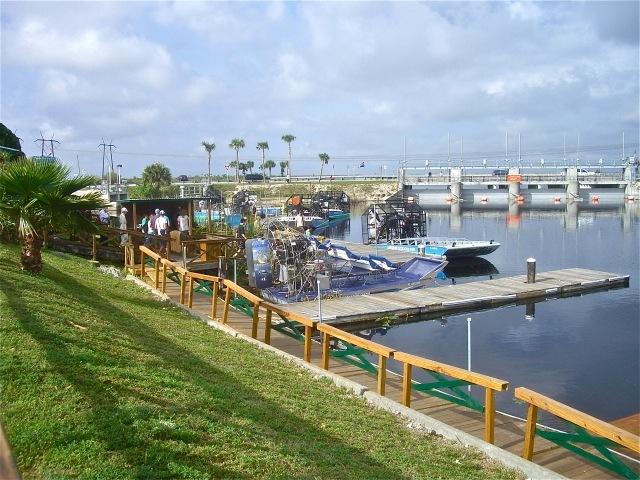 This entry was posted in Fort Lauderdale Mission on February 28, 2012 by Bill. As we were waiting for sacrament to start we had a pleasant surprise when a sister we had visited a few weeks ago came over and said hello. She is a lovely woman but due to some problems in her life she had not been coming to church. We dropped by to get acquainted and found her to be very open and happy to see us. We had heard from bishop that she had come out a couple of weeks ago but we did not see her but she was not at church last week. So to have her come this week and look for us was a great blessing. 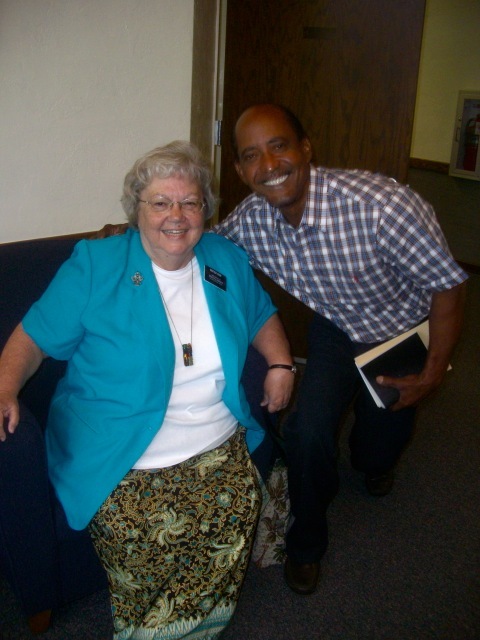 It is often the small things and successes that make being seniors missionaries a real blessing. I have to mention that one of the high priests is a baker and most weeks he brings treats for priesthood. Today it was delicious soft brownies with a little touch of coconut and banana nut cupcakes. I mentioned that it reminded me of Primary…I never went to Primary when I was young, but I can remember our young children coming out of Primary with a treat in their hands. While we were waiting to go to a meeting in Weston ward, we ran into brother Angel and took this picture. Angel was the first member we met when we came to church for the first time. He was very friendly and we were kind of surprised that he had been baptized just a couple of weeks before and had not yet received the priesthood. He acted like he had been a member forever. We found out later that the story of how he found the missionaries and was baptized was a golden one. He is another of God’s sons who are on the path to Eternal life. 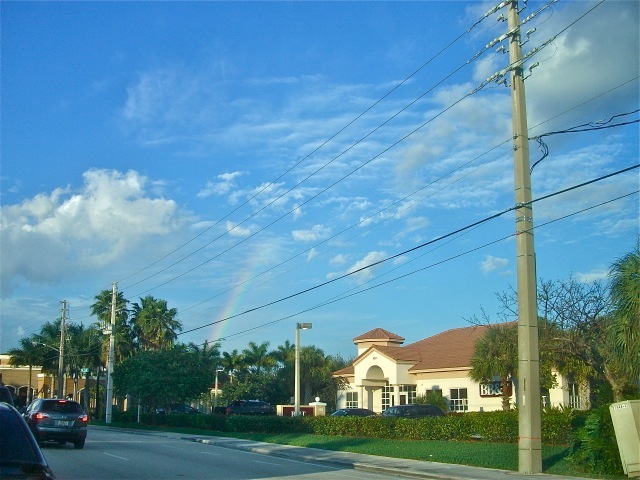 This entry was posted in Fort Lauderdale Mission on February 27, 2012 by Bill. 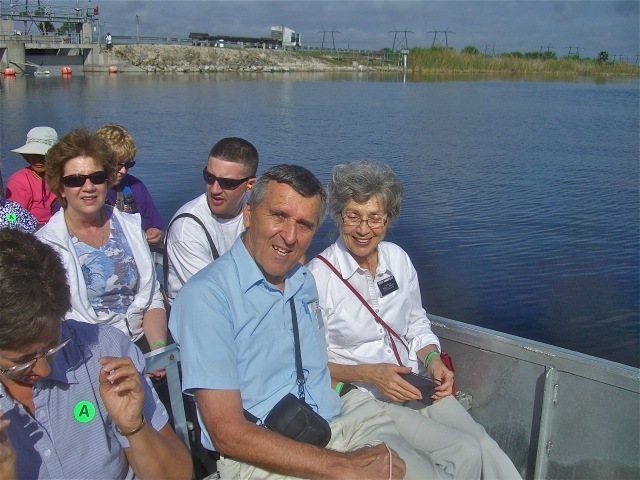 This morning we took picked up Elder and Sister Sommerfeldt and went to Weston for an airboat ride. We waited until it was our turn to board. The Sommerfeldts are good company. 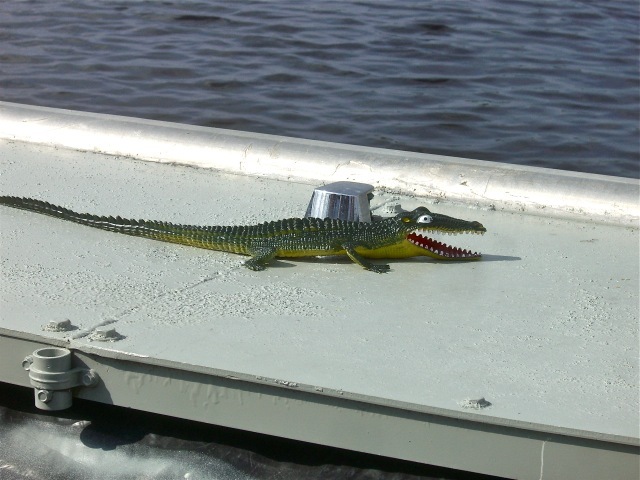 This was the mascot for one of the two boats we took out that broke down. When the second one stopped they had to send a third boat out to rescue us and so we had a mid-canal boat exchange – but the third time was charm. 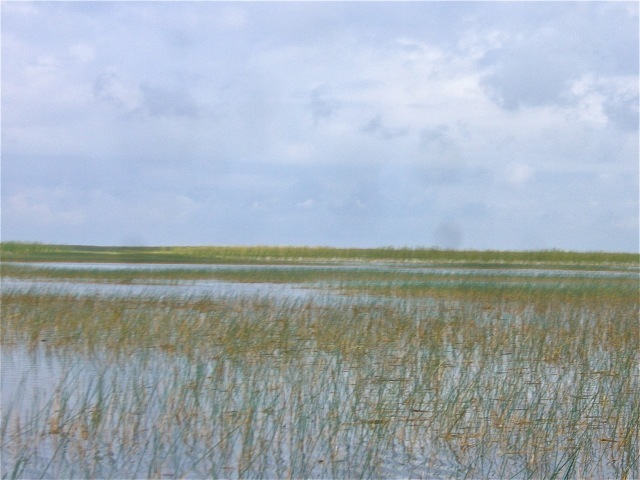 Flashing through the water over the sawgrass at 35 mph was great fun. 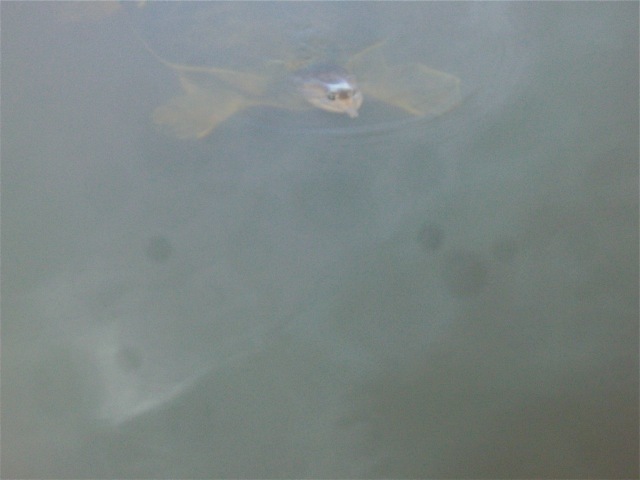 While we looking at an alligator, this friendly turtle showed up to see what the fuss was about. 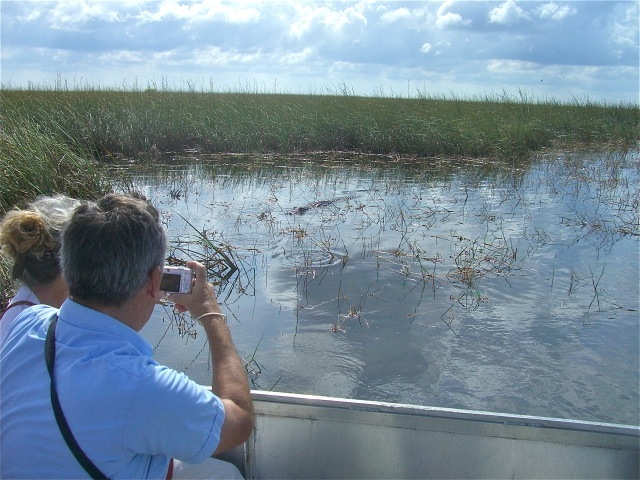 Elder Sommerfeldt taking pictures of a rather young gator that we saw. 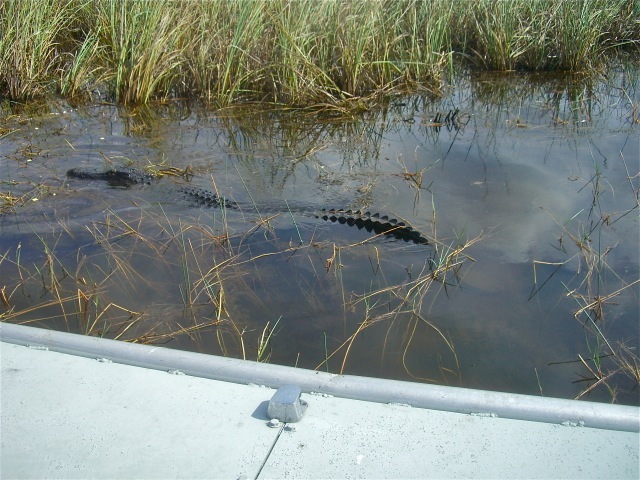 This was a larger one that was deeper in the glades. 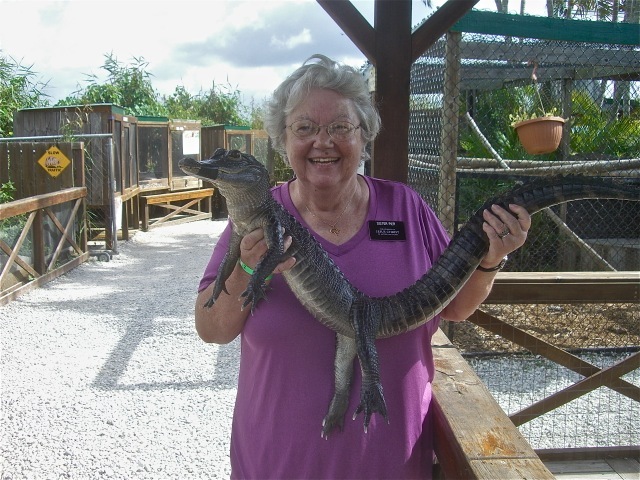 Mary got to hold a young gator…notice that they tape the snout closed so visitors do not lose fingers or other important parts of their body. 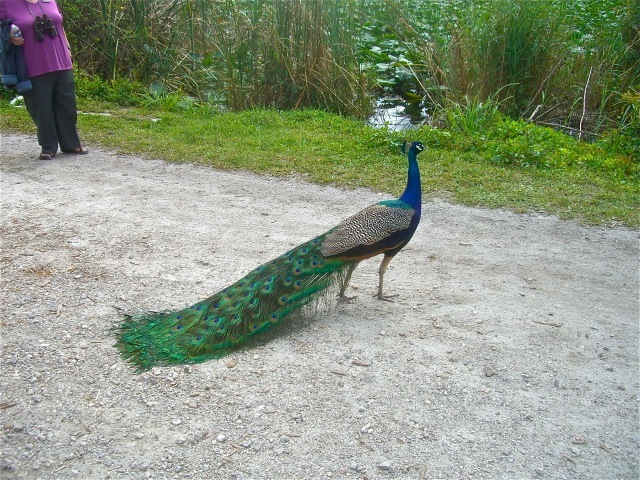 As we were leaving this peacock came out to say goodbye…he did not fan his tail no matter how often we asked him. It was a nice P-day trip but nothing like a game park tour in Africa…but then not many things are that good. This entry was posted in Fort Lauderdale Mission on February 25, 2012 by Bill. I just wanted to post these three pictures that mean something special to us. First Jim and Kristy’s great family picture that shows three of our beautiful children. Then there is the beautiful wedding picture of our dear young friends from Indonesia Rudi and Femmy. 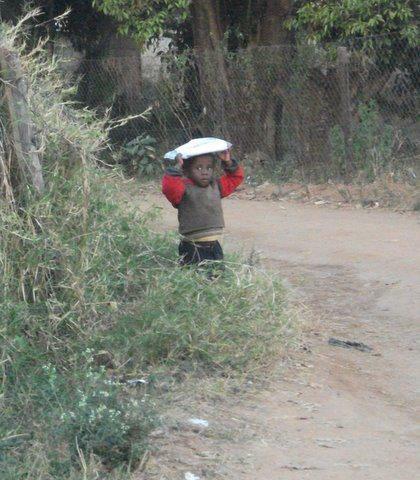 Finally a picture that was posted on another blog of a beautiful African children using a humanitarian kit as a hat…or perhaps he is learning to carry things on his head. One of the joys of serving in Africa was seeing all the shining faces of the young children. This entry was posted in Fort Lauderdale Mission on February 24, 2012 by Bill. 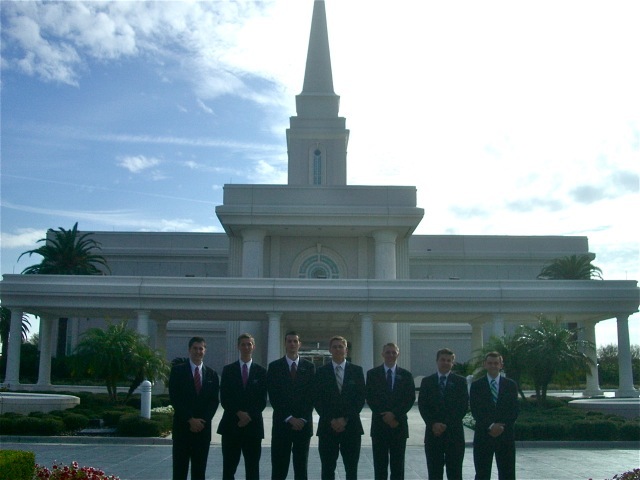 We had the great blessing of being able to take the 7 departing elders to the Orlando temple today. We were able to do this almost as soon as we got here and it was a wonderful experience. However we really did not know any of the elders and sister who were leaving. This time we knew four of them very well and one fairly well. The other two we knew only through forwarding mail and the mission board. 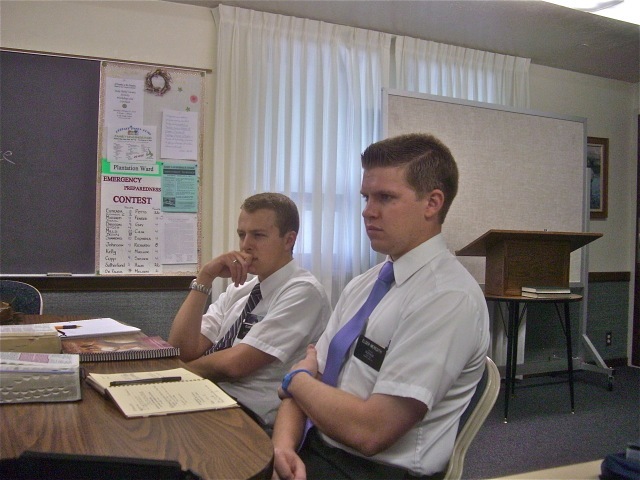 However in the 15 hours we spent with them we came to know and love elders Farr and Chandler as much as the others. The 7 stalwart Elders who have faithfully served the lord here in the Fort Lauderdale mission for two years. 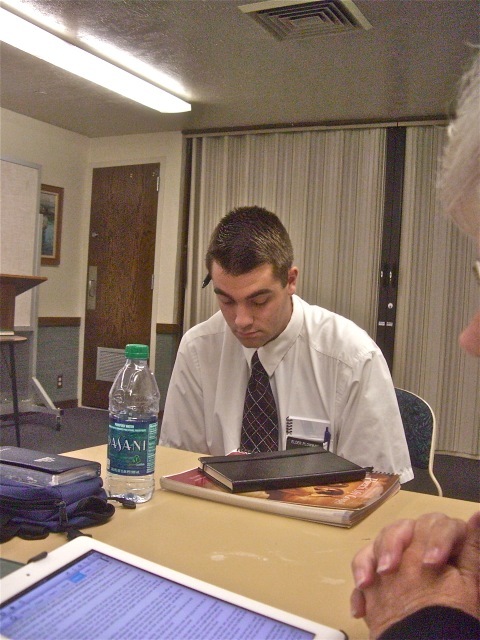 Elder Neeley who we worked closely with for the months we have been here and who saved me from driving for 7 hours. Later he confessed he was much more comfortable driving when going long distances than being a passenger. A view of the temple above the trees as we drive up the hill. 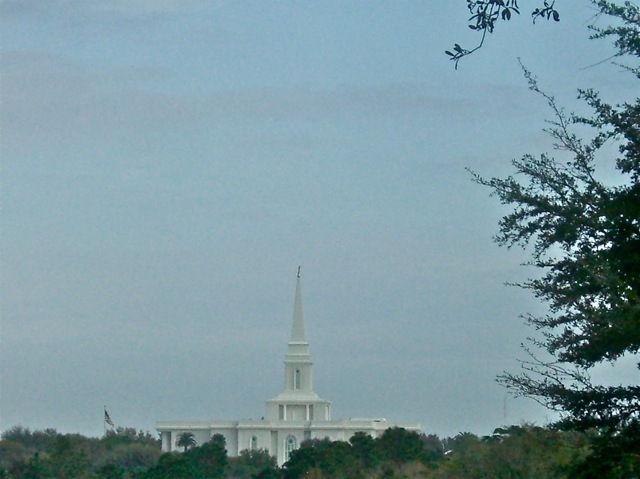 The temple sits on the highest hill we have seen in Florida…the elders were all impress with the height which was probably 220 feet or so above sea level. We were up at 4:00 am and at the Plantation chapel by 5:20. This group of elders were so obedient that all but one of them were already there and the last one drove up at 5:31. We took only enough time to take a couple of pictures and say a prayer before we were on our way. 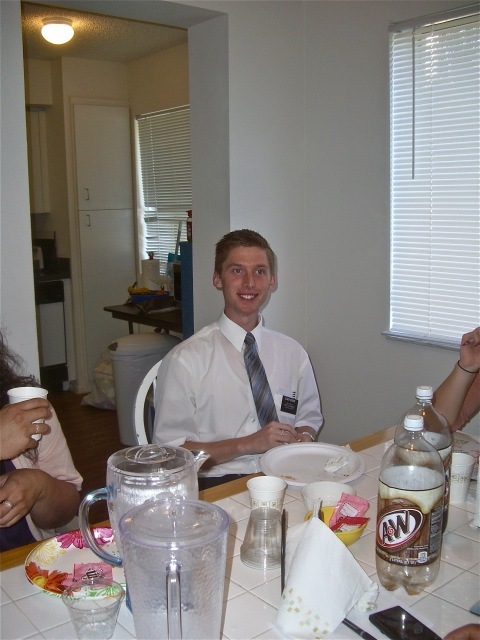 Elder Neeley, who was just released as an assistant wanted to drive and since had a lot more experience with the van than I did, I was happy to let him. The seven in front of the temple. Next time I am going to take this from the other side like they suggested. Mary beside one of the twelve fountains on the grounds. The corner stone that was laid in 1984. Mary beside the wall that looks like a door that faces the traffic that is streaming by what I think is the North side of the temple. 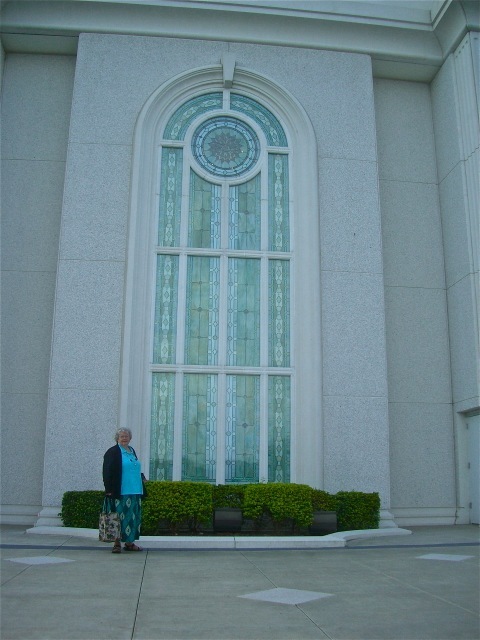 Mary beside one of the beautiful colored glass windows. Finally a view of the temple with the dark clouds behind Moroni. 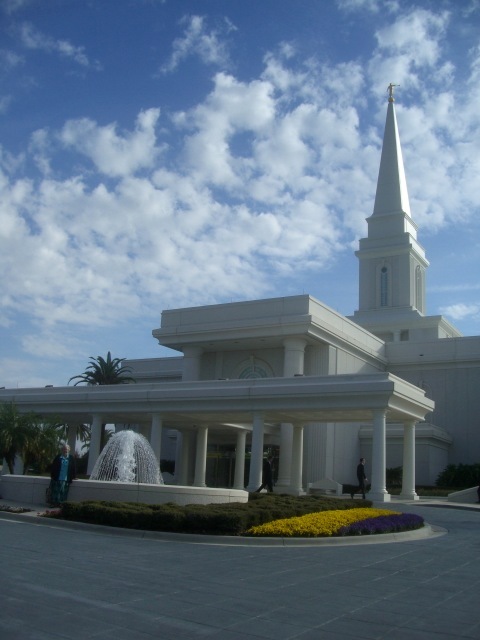 We got to the temple early enough to take a tour of the grounds and take pictures before going in for a session and then President Tilton of the temple presidency spent 30 or so minutes talking to us about the temple and answering any questions that the elders might have. 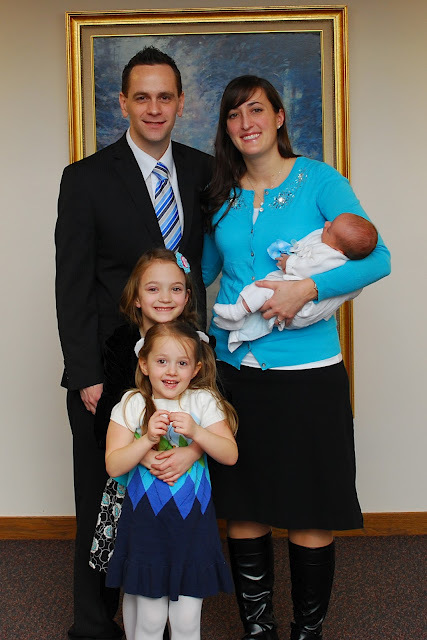 Missionaries hold a special place in his heart because, like me, he and his wife are converts. He spoke about the special place the elders would have in the hearts of each person they brought unto Christ and were baptized. After the temple session we all went to Firehouse Subs where all the missionaries love to eat. For some reason I forget to take pictures while we are there. Maybe it is that the food and company is so good that nothing else is worth thinking about. I did give a pass-along card to one of the servers who I chatted with for a short time. Elder Neeley decided he would like to also drive home and was not about to take the pleasure away from him. One thing he kept spotting was alligators in the canal along the side of the expressway. No one else could see them but he swore that they were there. We made it back to the mission home by 5:30 where we had a delicious dinner and good conversation. We found out that President Anderson was a swimmer and had swam from Alcatraz to San Francisco. 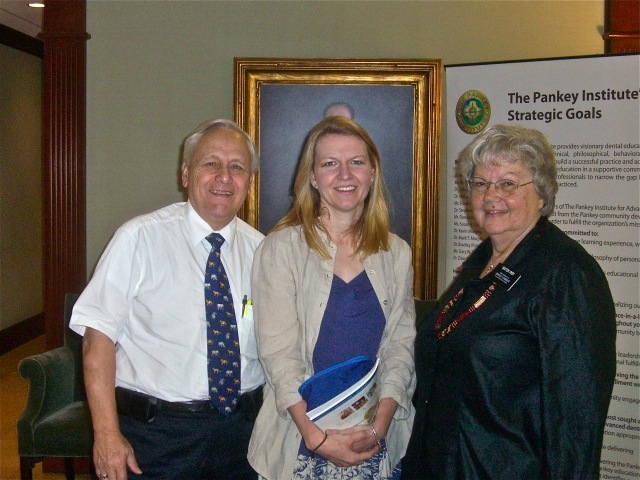 Sister Anderson proudly showed us a picture of the President in his wet suit just after he had finished. After dinner I clean-up while the elders first shared a special experience they had on their mission and then bore their testimonies. We were privileged to share in these experiences. We left after that and made it home by 8:30 – some 15 1/2 hours after we left this morning. Physically we were tired but spiritually we were fully charged. This entry was posted in Fort Lauderdale Mission on February 23, 2012 by Bill. 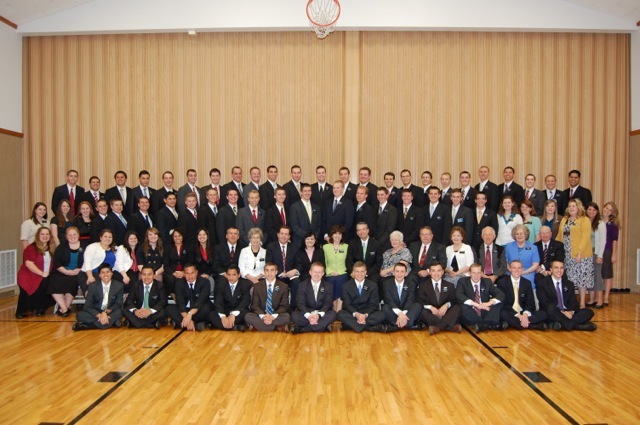 These are the pictures from the recent conferences that were held when Elder Gavarret of the 3rd Quorum of the 70 did a mission tour. 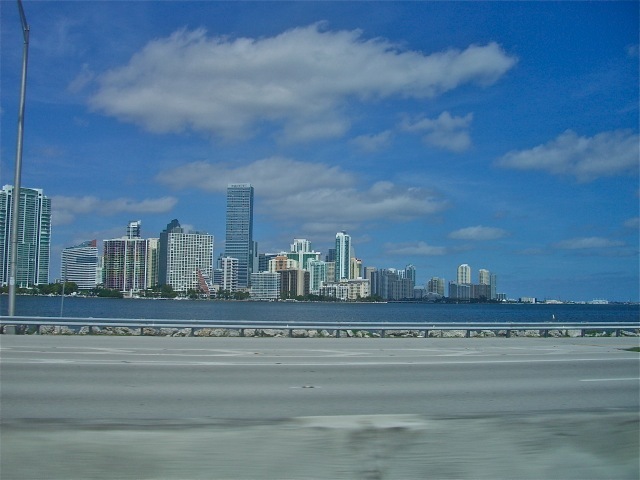 The left picture is the North part of the mission from about Fort Lauderdale North. We would have gone to that one but we volunteered to take care of the office. So we are in the right hand picture which was good because we got to meet a lot of missionaries we did not know except from their names on mail. 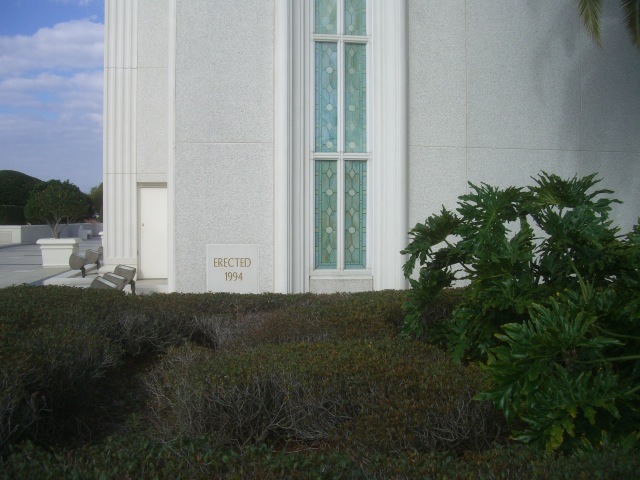 This entry was posted in Fort Lauderdale Mission on February 21, 2012 by Bill. We had a very busy but special day. 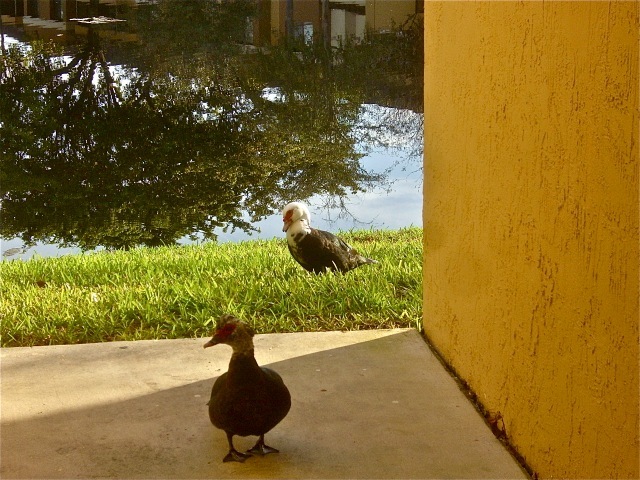 As we walked out of our apartment we were met by these two ducks…there is always ducks but they usually stay out on the grass. This one just wanted to get a closer look. We spent the morning doing lots of different things at the office. I helped with finances, cars, and phones. Mary worked on getting missionaries moved around for transfer…only on the computer of course after President Anderson and the assistants have made the changes that will occur on Wednesday. The big event of the day was Shauna came down from Orlando where her and Kelli are visiting. 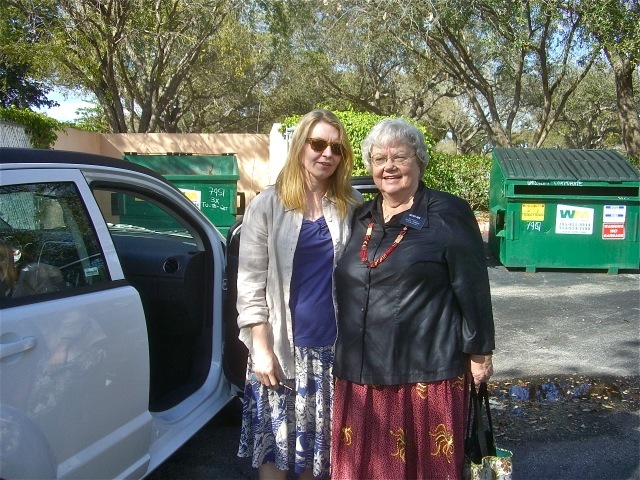 She stopped at our office to pick us up so we could go with her to visit a teaching institute in Key Biscayne. 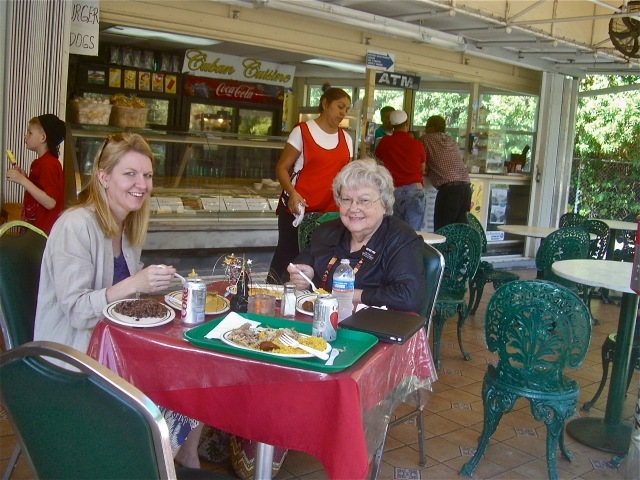 After her tour of the institute we had lunch at a nearby Cuban fast food shop. The food was OK but not something I will want to eat very often. After lunch I drove back to the office with a quick detour to show her our apartment. We bid goodbye to her in the parking lot and went back in to put in a couple more hours of getting things together for Transfer meeting tomorrow. We will not be there because we will be taking the soon to be released elders to the temple but there were things that others will need to take care of that we could help get prepared for the big day. We have had a very busy and very special day. While I made a run into the office to drop off some things and take care of the Saturday mail, Mary got things organized for having the district over for lunch after the District Meeting which was moved up an hour. As usual Elder George directed and taught a very spiritual meeting which focused on how close the district was to taking off as far as baptisms are concerned. 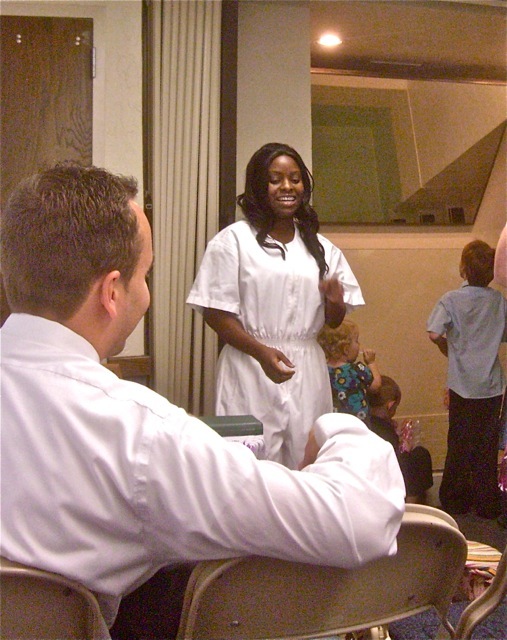 He also taught from Moroni 7 about faith and how it leads to baptism. 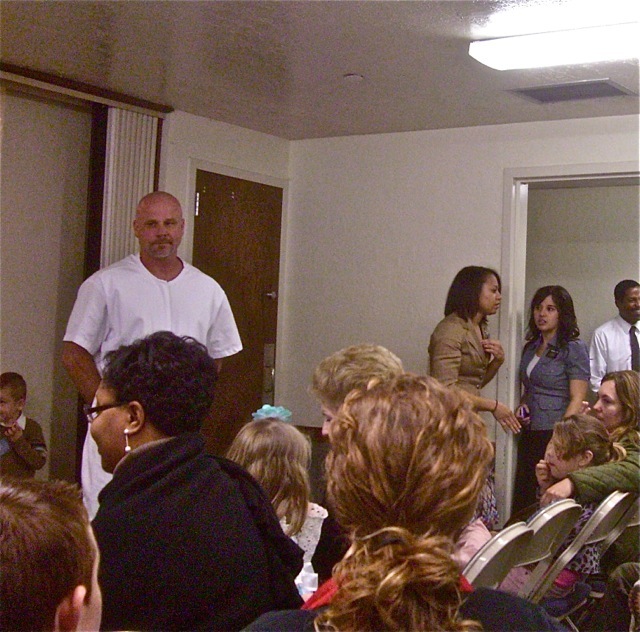 After the lesson the Zone Leaders – Elders Beard and Clark demonstrated a role play on how to get a baptism commitment. Elders George and Smoot then taught me. They got the spirit to come in but missed an opportunity to introduce the Gift of the Holy Ghost. I have to say that it was a very powerful meeting for me. As we sang the songs I remembered a talk I read on Saturday about how I needed to actually think about the words I was singing if I wanted to get the blessings that comes from singing the Lord’s hymns. I found that it was true and so I felt the spirit as I sang. After the meetings we hurried home to set up for the lunch. We were had again made sure that Sisters Pack and Beck were invited and they asked if it was OK for their YSA branch mission leader could come. Since we had plenty of food we said sure. A little later the sisters asked if Sisters Holladay and Mata’u who were in the area for a doctor’s appointment could come and of course we said yes. The more the merrier. 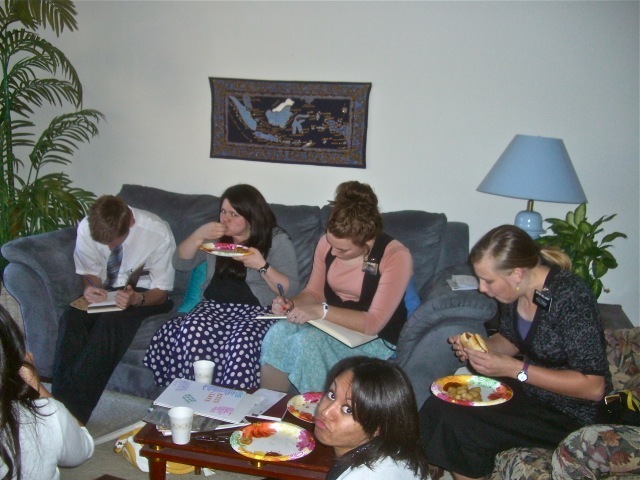 So for a couple of hours our small apartment was full of busy missionaries who wrote in each other’s journal, ate, took pictures, and just had a good time being together. Just as with South Africa it is a special time for us. 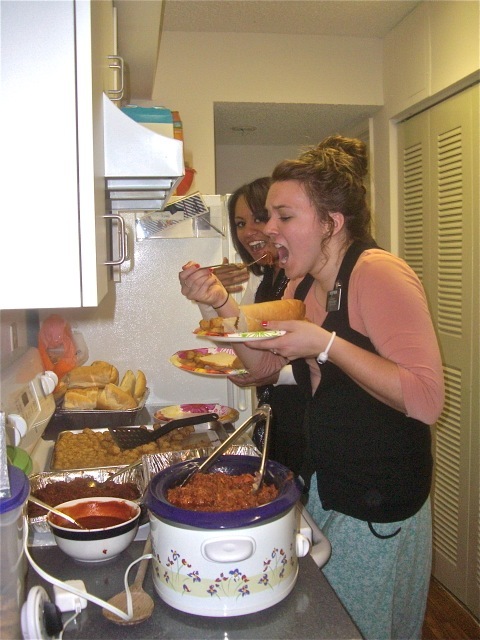 The food was ready – Sister Beck could not wait – Everyone is too busy eating to talk so it was a success. 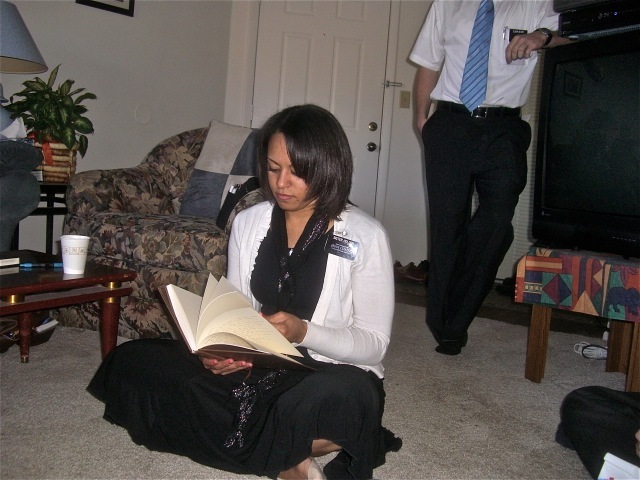 Sister Hong writes, Sister Holder reads, Elder George socializes. Sister Holladay demonstrates ‘the claw’ while sister Beck looks on. The sisters wanted a picture with elder George and he made sure he was not touching any of them. Then it was time for a final district picture before they had to leave so Elders George and Clark could attend their exit interview with President Anderson. After the missionaries had left we found this delightful note from the sisters which is displayed next to the program for the funeral. By the time we had cleaned up and straightened out it was time for both of us to take naps. 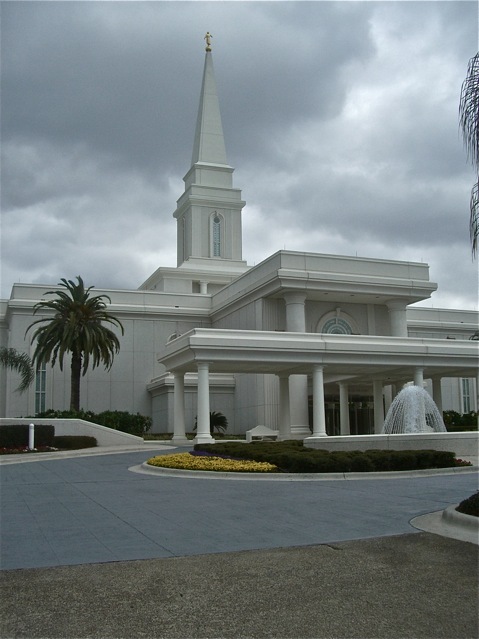 This entry was posted in Fort Lauderdale Mission on February 20, 2012 by Bill. I can not say that we have been so busy that I did not have time to write here. It just has not been important enough for me to sit down and produce something interesting enough to share. But I am determined that over this weekend I will do some catching up just in case anyone is really interested. 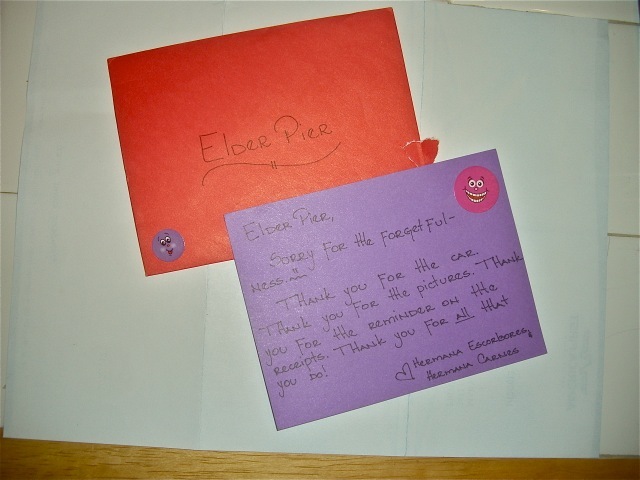 Sister missionaries are very thoughtful and often send notes thanking us for some little thing we have done for them. They also often decorate their reports with little drawings. We are lucky if the elders manage to write clearly enough to be read. On the way home one day we saw this rainbow – the first one we have seen that was not in the fountain at our apartment. On the 10th we were invited over to the Collins to go to dinner with them and the Beagleys . 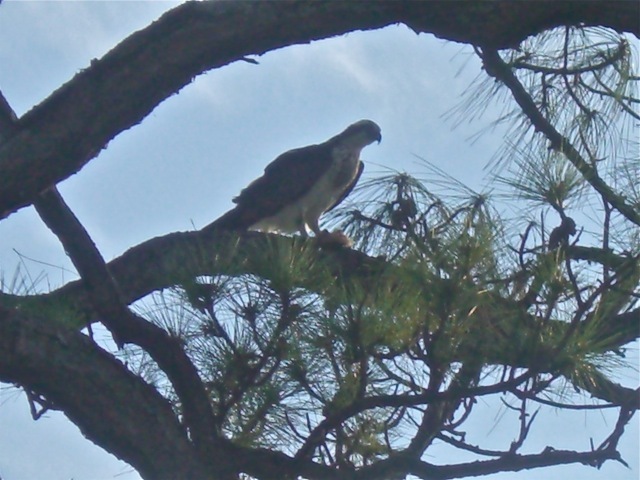 Before we left I noticed this osprey in a tree at the back of their house and got a fairly good picture of him at rest. Dinner was OK but the company was great. On Sunday the 12th we had the opportunity to attend a baptism for two very happy people who were taught by Sister Hong and Sister Holder. I am always touched by the simplicity of the ordinance of baptism. 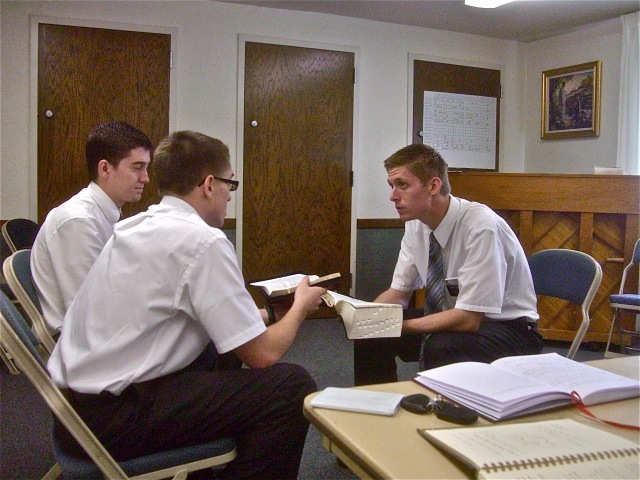 A priesthood holder calls the candidate by name, declares his authority , and then in the name of the father, son and holy ghost washes away all sin by immersing the person in water and they arise as a new person as they have entered the narrow gate and set their feet on the straight and narrow path that can lead them to Eternal Life. The spirit was strong and they had beautiful smiles as they came up out of the water. 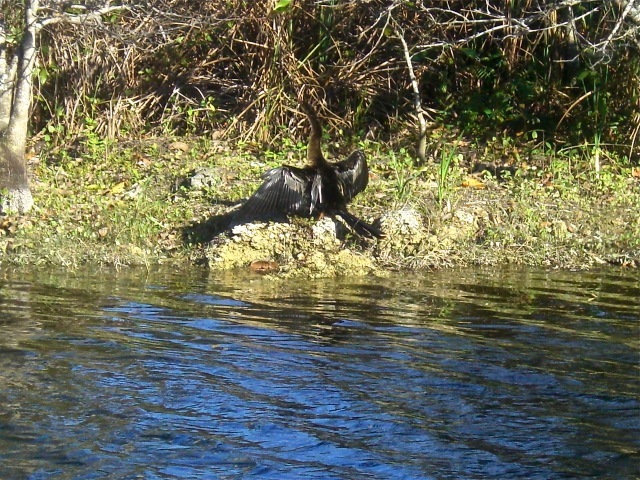 We were coming home from the chapel on Sunday and saw this beautiful black bird stretching it’s wings out to catch the sun. We see the birds here do this often and wonder why. Are they just enjoying the sun or are they drying off? Whatever the reason it was fun to sit and watch the action. 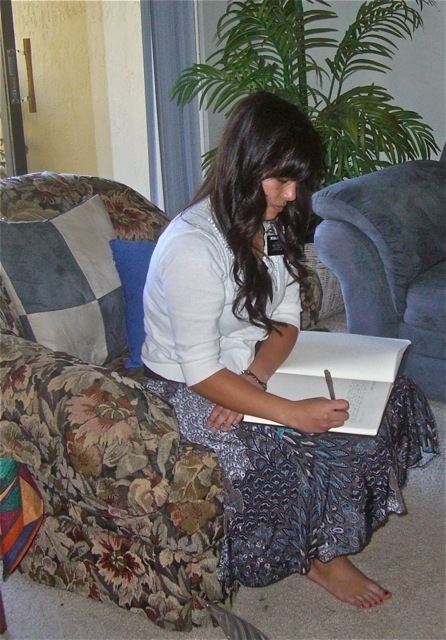 I started this post by saying that sisters often send nice notes and that elders never do. 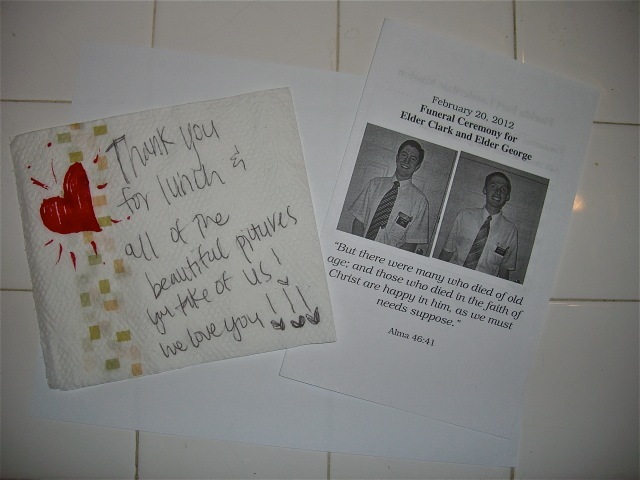 However on Valentine’s day the assistants – Elder Neely and Elder Kealemakia spent much of their spare time making a pile of valentines to take to their investigators and recent converts. When I asked them later about how it went they said it was great. So you see some elders do have a softer side. The final picture was taken on the 14th as we walked over to have our valentine pictures taken at the club house. I want to try this picture again when it is not quite so dark and the detail of the trees can be seen. 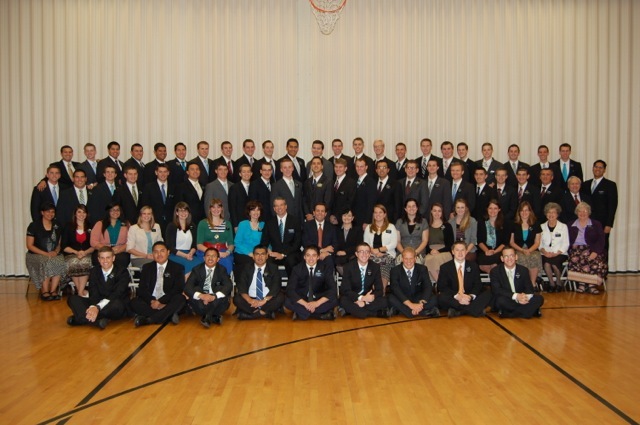 Today we went to a conference in Miami where Elder Gaverett of the 3rd quorum of the 70 taught about missionary work. 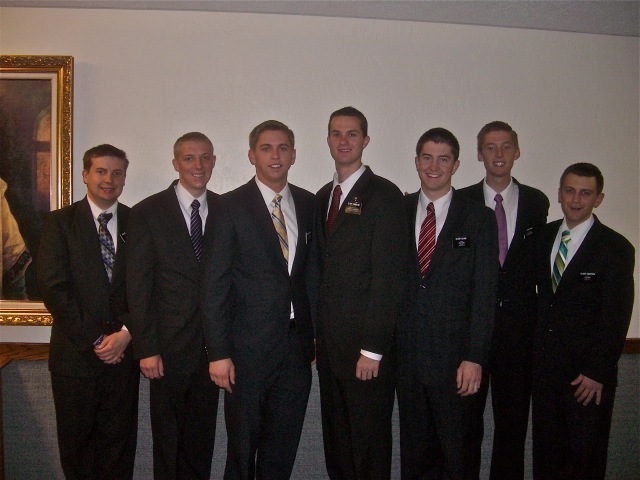 It was also the last time that some of the missionaries would see each other as there is a group of 7 going home on Thursday. I completely forgot to take any pictures until the last minute when I caught elder Neeley saying goodbye to elder Castillo. I will take more pictures of the 7 when we take them to the temple on Wednesday. 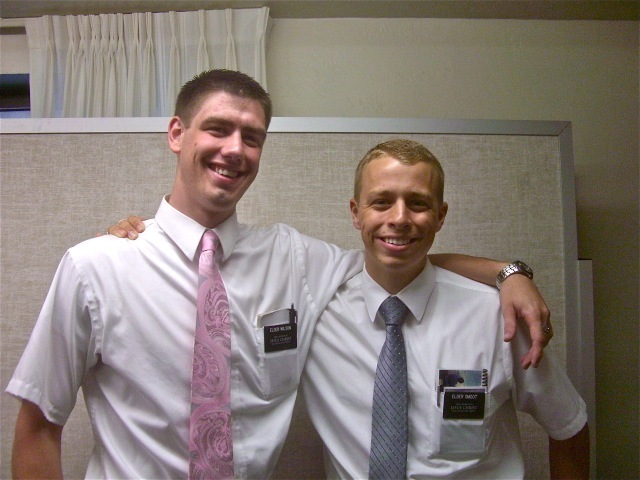 I am sure I can not fully understand the bond of love and friendship that is made between companions as they serve the Lord and teach the gospel 24/7 together for anywhere form 6 weeks to 6 months. They have experiences that will shape their whole lives and after. 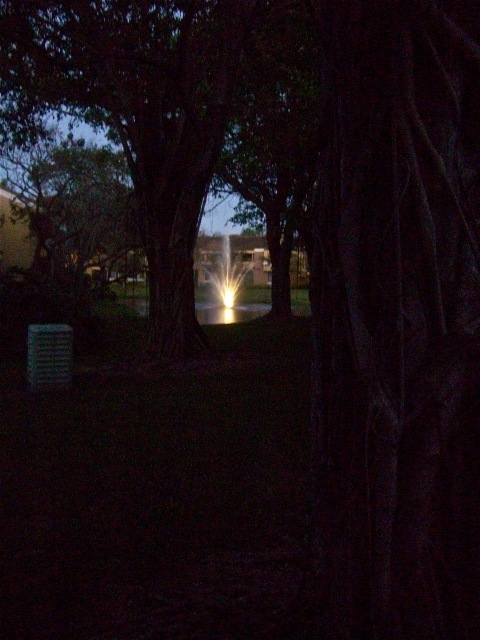 This entry was posted in Fort Lauderdale Mission on February 18, 2012 by Bill.